This is another in Orchestral Concerts’ series of live concerts given by visiting ‘Eastern European’ orchestras and ensembles - Eastern in the then political not geographical sense. 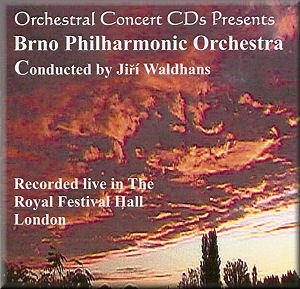 In this case we have another performance by the orchestra from the ‘Manchester of Moravia’ - or maybe Manchester is the ‘Brno of Britain’ - under its principal conductor of the time, Jiří Waldhans. We have already experienced their Suk Asrael (see review) which was given in the desperate year of 1968. Now we have the canonic Czech symphony, the touring warhorse of the New World. It’s a perfectly rectitudinous achievement, tempi being adeptly aligned and the emotive temperature of the music neither over-cooked nor coolly dispassionate. In truth there is nothing interpretatively distinctive here, which might be another way of saying not that it is dull, but that it sounds fine enough. The flute and wind choir statements generally register with authority, and climaxes are anticipated with well calibrated gradient. Solos from the principals are especially well caught in the recorded spectrum, and they’re also well balanced too. The hushed hymnal-leaning moments of the slow movement emerge with warm lyricism, so too the Bohemian wind band fixations of the scherzo. The brass still retains its distinctive tone; thankfully unpasteurised then. Jan Novák’s Philharmonic Dances are a welcome novelty. The composer is probably better known for his film scores than for his orchestral music but the Martinů pupil - not pace the notes, the ‘only’ one - certainly has imbibed some of the master’s ebullience and rhythmic snap. The three dances are joyful statements, rich in Moravian-sounding cadences. In the central dance we hear the build-up of something akin to the Julietta cadence, but also a fusion of great charm and a pawky, alert rhythm that has plenty of individual and filmic character. There are exotic winds in the last dance of the three, evocatively folkloric, and replete with lissom string figures and some syncopation, emulations of the hurdy-gurdy. This is music of welcome vitality and uninhibited brio. Visiting Czech orchestras - there seem to be dozens these days going by different sounding names - should have the courage to disinter it. We end with a gentle diptych salute to the native muse, Delius. Maybe they also had the not-so-long departed Beecham in mind as well when they played the Prelude to Irmelin and La Calinda from Koanga with evident sympathy. The recording quality is certainly first class and has real clarity and natural balance. Whatever the market may or not be for such things, I happen to believe that it’s good that such performances have been preserved, and presented in this way.